An effective and gentle washing powder, safe for even the most sensitive skins. Fragranced with cleansing essential oils. Use 1/3 to 2/3 cup per load. Can also be used for hand-washing. 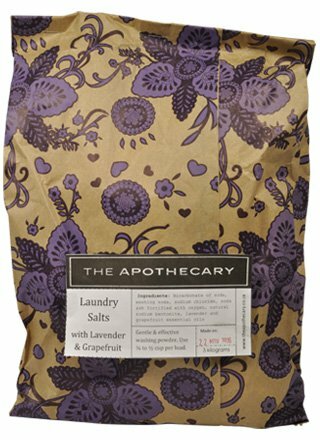 Like all The Apothecary’s Spotless Cleaning products, our Laundry Salts clean beautifully without harming you, your home or the environment. They are compatible with grey water systems, kind to septic tanks and help keep pipes and drains clear. They leave no harmful residues and emit no noxious fumes. They break down readily into benign, natural substances that are harmless to oceans and waterways. The delightful scent of lavender & grapefruit comes from cleansing, therapeutic pure essential oils, organically grown. 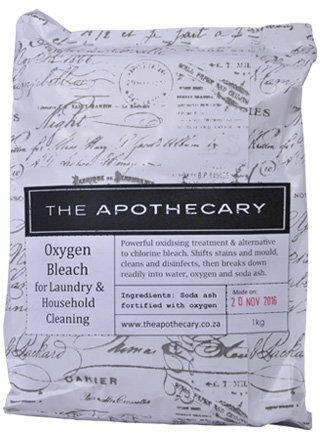 This powerful oxidising treatment and alternative to chlorine bleach shifts stains and mold, cleans and disinfects, then breaks down readily into water, oxygen and soda ash. Soak your laundry before washing to whiten and brighten, or to pre-treat stains (1 cup to 4 litres of warm water, or more for heavy stains). Add 1-2 tablespoons to laundry to boost cleaning power. Will not weaken fabrics, nor cause greying or yellowing as chlorine bleach can. Dilute with warm water to use for general cleaning all round the home (1 cup to 4 litres of warm water, or more for heavy cleaning, or mix to a paste with a small quantity of water to form a powerful cleaning scrub for showers etc.). Sprinkle in toilet bowl and leave for 15 mins or more before scrubbing to clean and disinfect. Oxygen is nature’s cleaner. It is the additional oxygen atoms that grab onto some of the H2O in rain to form H2O2 as it falls through the ozone layer that make rain so special. Our own bodies use oxygen in a similar way to fight off disease and infection, manufacturing H2O2 in our cells. Here H2O2 has been used to fortify soda ash with oxygen, producing a powerful cleaner and disinfectant that breaks down quickly into harmless substances.